For June, Sarah Coombes, Paxton’s Mail Order Manager, has selected the savoury cheese Dorset Blue Vinny PGI* (Pasteurised cows’ milk, vegetarian rennet) to enjoy. Dorset Blue Vinny is a cheese of some antiquity and in the 18th and 19th centuries it used to be made by every farmhouse in Dorset as a way of using left over milk. The name Vinny derives from the old English ‘vinew’ or ‘finew’ meaning mouldy. Today the cheese is made in one place, Woodbridge Farm, near Sturminster Newton, Dorset. The farm is run by Richard Davies and his family have lived and farmed there for over 40 years. They make the cheese using milk from their own herd of 270 Friesian cows and other milk that comes from surrounding farms. The milk to make the cheese is skimmed to give it a fat content of approximately 3%. Starter culture and rennet is added to the milk and once the junket has reached the desired consistency it is cut with vertical and horizontal knives, then heated. During the heating the junket is stirred to allow the curds to float in the whey. The curds are kept warm overnight and the following morning the whey is drained and the curds are cut into blocks. The curds are then turned every 20 to 30 minutes to allow the whey to drain away, then broken up by hand, salted and filled into the moulds. They are lightly pressed for four hours and then turned. Four days later the moulds are knocked out and the sides of the cheeses are rubbed down to allow the mould coats to develop. The cheeses are then matured in temperature and humidity controlled conditions and turned daily. After four weeks the cheeses are pierced repeatedly with long narrow pins from side to side. This breaks up the curds and allows air to enter so that the moulds in them are activated to createthe characteristic blue veining. They are then turned daily and repiened for a further 12 to 20 weeks. 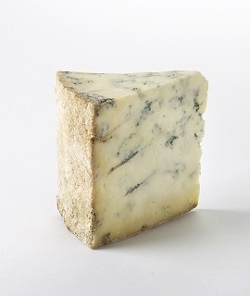 Dorset Blue Vinny has a strong spicy flavour from the blueing with a texture that tends to crumble.